Greggs has become a bit of a national institution over the last few years, with firm favourites being their steak bake, sausage bean and cheese bake, or more recently, the vegan sausage roll. And that doesn’t even include the sweet treats that they have. There’s no better way to keep hunger at bay than a snack from Greggs. We all know what it’s like when you’re feeling a bit peckish but can’t get out of the office, or you can’t leave the house because the baby’s asleep. A coffee and doughnut would just hit the spot. Well don’t fret, Pinga is to the rescue..
It’s really easy with Pinga. First download our nifty little app, then let us know what your request is and one of our Pinga Partners will respond straight away to you. The details of what you are after will then be clarified and then off they’ll pop to bring your request straight to you.. You don’t need to spend a minimum amount with Pinga so you can just order exactly what you want, when you want. .Our Pinga Partners are trusted, reliable and ready and raring to go. They will get your Greggs order to you quickly and with care. If you want something picked up from somewhere else too, that’s absolutely fine! Actually, we love that. Just put your request through and our Pinga Partners will pick it up. We’re here to help at Pinga and would love to have you here with us. To help you get started today, here’s a closer look at our service and how everything works. Pinga delivers any items from Greggs today. 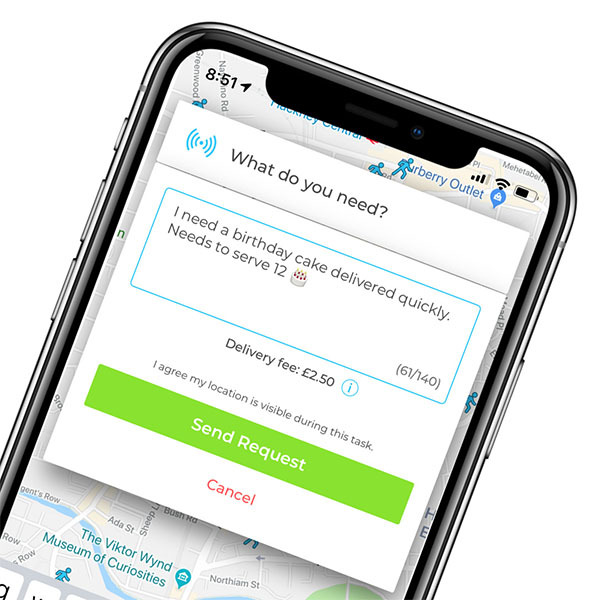 Infact our service normally delivers within an hour, so if you’re looking for same day delivers from Greggs, send your request via the Pinga App. Describe what items you needs to be delivered from Greggs and send your request. Pay securely within the app and receive your Greggs items to your door!